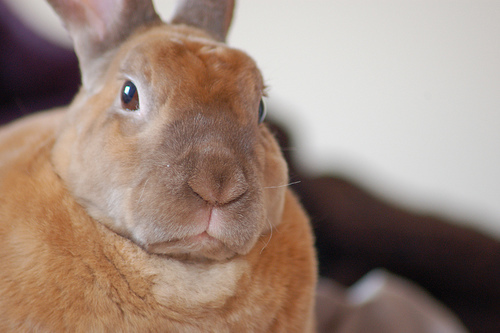 I do not own the rights to this rabbit, but am using the photo in compliance with a restricted Creative Commons license. Do not download or use this photograph without first consulting the terms of the license. The license terms may be viewed here. See other photos of Derby here. My personal favorite: Derby trying to smile. BONUS BUNNY! You will not believe the whiteness, minuteness or---yes--- noselessness of this little guy at CO. Click it! Click it! YOU KNOW YOU WANT TO. Alternatively, or in addition, see my photo collection of cross animals, annoyed at being forced to participate in Christmas (Scroogekins). I find the lack of comments on this post disappointing.